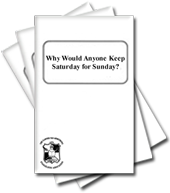 Why Would Anyone Keep Saturday for Sunday? Just as it keeps the weekly Sabbath, the Church of God also observes the annual holy days that were ordered by God, kept by the ancient Israelites and continued by the early New Testament Christians. These seven annual "appointed feasts" pictures God's plan of salvation for man. The annual holy days are named the First Day and Last Day of the Feast of Unleavened Bread, Pentecost, the Feast of Trumpets, the Day of Atonement, the Feast of Tabernacles and Last Great Day. These days occur on specific dates of the current Hebrew calendar, with the exception of Pentecost which is counted in a biblically prescribed manner. Like the weekly Sabbath, each Holy Day is reckoned from the evening sunset to the evening sunset. The functions of these annual holy days are partly the same; those of the weekly Sabbath. The primary importance of the festivals is their function as spiritual symbols, outlining God's plan of salvation for the individual and the world. These days include religious instruction and worship which provide for spiritual renewal on a regular basis. The holy days serve as spiritual, psychological and social high points of the year. They allow people to get together in an atmosphere of leisure and enjoyment. In addition, these days provide opportunity to rest physically. Psychologically, the human need for change of pace and a time to forget the ordinary concerns of day-to-day life is met by these periodic festivals. However, the central concern of these days is spiritual. Supplementing the weekly Sabbath services, there is still a need for intensive concentration on spiritual matters over a period of days without the distraction of the normal routine of making a living. The spring and autumn festival seasons supply this, especially the Feast of Tabernacles which is customarily held only in a few central locations. The Passover represents the sacrifice of Christ which pays for the sins of all who repent and accept it in faith. It also represents partaking of eternal life through Jesus Christ (shown by the bread and wine which symbolize His body and blood). The Feast of Unleavened Bread is symbolic of the continual removing of sin from the spiritual sphere of one's life and the continual practicing of a new godly way of life, represented by Christ, who was unleavened, that is, without sin. Pentecost pictures both the foundation of this New Testament Church and the sending of the Holy Spirit for the individual. The Feast of Trumpets symbolizes the spreading of the gospel to the world like the trumpet call of a watchman; it also shows the return of Jesus Christ to set up the Kingdom of God on earth. The Day of Atonement, a solemn day of fasting and self-searching represents the time when sin shall be placed upon the head of its ultimate source, Satan the devil. The removal of the cause of evil allows God's Kingdom to hold unopposed rulership over mankind. The Feast of Tabernacles is symbolic of the millennial rule of God through Jesus Christ and His saints. It shall be followed by an opportunity for salvation for all who have lived and died and were not previously called to have a part in the first resurrection-this is the meaning behind the Last Great Day. The culmination shall be the new heaven and new earth (Rev. 21), in which all creation shall be renewed in preparation for the humanly unfathomable eternity on beyond. Apart from the Sabbath there is no explicit mention of the annual festivals in Genesis. However, the Hebrew word translated "appointed time," (mo'ed) used else-where in the Old Testament to specifically refer to the annual festivals, occurs in Genesis 1:14 in reference to purposes for God's creation of the heavenly bodies. Exodus 12 is the first clear biblical reference to annual festival days. The institution of the Passover at the time of the Exodus is well known and need not be rehearsed in detail here. Exodus 23:14-17, a part of the Old Covenant passage, describes "three times" or seasonal observances in a year within which the seven annual holy days fall. These "times" include the Feast of Unleavened Bread, the Feast of Harvest (Pentecost) and the Feast of Ingathering (Feast of Tabernacles). Similarly, Exodus 34:18-24 lists the Feast of Weeks (Pentecost) and the Feast of Tabernacles. Originally all of these festivals were built around the system of agronomy in the ancient Near East. By following this logical system the holy days gain significance and their spiritual purport, can be more easily understood. Several passages give a more complete and detailed description of the annual holy days. The most complete is Leviticus 23; others include Deuteronomy 16 and Numbers 28-29. The following information is taken primarily from these passages. Passover and Days of Unleavened Bread. The Passover lamb was slaughtered on the 14th of Nisan. It was eaten with unleavened bread and bitter herbs on into the evening. That night the death angel passed, spared the Israelites who had put the blood of the lamb on the doorposts, and slaughtered the Egyptian firstborn. This began a period of seven days of eating unleavened bread. The 15th and 21st days were holy days on which no work was to be done. The intervening days were not holy days, but no leaven was to be eaten or any leavened products to be in the houses. It was on the Sunday during this period that the first sheaf (omer) of the new harvest-was offered as the Wave Sheaf offering. Only after this offering could the spring harvest begin. Granted, other groups used either the first or last holy day of the Feast of Unleavened Bread as their reference for counting, rather than the weekly Sabbath. This interpretation evidently originated in the change of the meaning of the Hebrew word shabbat. This is the word occurring three times in Leviticus 23:15-16 (and translated "Sabbath" each time in the translation above). The original meaning of the word was the weekly Sabbath, but it was occasionally used for the annual Sabbaths, as well, though always clarified by the context. .However, during the intertestamental period, the word came to mean "week." Thus, the Pharisees took the word "Sabbath" in the sense of "annual Sabbath" and "week," so that they counted seven weeks" beginning with the first holy day. The Essenes, while using a solar calendar, and the Falashas interpreted the word as "week," counting seven weeks from the Sunday after the Passover week. These interpretations, although originating before the first century A,D., were evidently incorrect. The term "Sabbath" was not likely to be used of an annual Sabbath without clarification. Thus, the Pharisaic method was unlikely interpretation. Further, to take the word "Sabbath" in the sense of "week," as the Pharisees, Essenes and Falashas all did, was anachronistic; the word did not have this meaning in Old Testament times. Day of atonement: The 10th day of the 7th month had quite an elaborate ritual in Old Testament times and continued up until the destruction of the Temple. It was a commanded fast day in which nothing was eaten or drunk for 24 hours, from the evening of the 9th to the evening of the 10th. On the day itself, the ritual of the two goats was enacted as described in detail in Leviticus 16. Two goats were selected. By drawing lots, one was chosen to represent God and the other to represent "Azazel." In later literature "Azazel" was considered a name for the chief of the demons, i.e. another name for Satan (I Enoch 9:6. 10:4). The high priest first sacrificed a bull for himself and entered into the Holy of Holies to sprinkle the blood on the mercy seat. Then, he slaughtered the goat "for the Lord" and sprinkled its blood on the mercy seat, as he had done the blood of the bull. In this way the high priest was the only person to ever go into the Holy of Holies, and then only on the Day of Atonement. At all other times, and to all other people, it was off limits. The goat for Azazel then had the sins of the people confessed over it by the high priest. After that it was taken away live into the wilderness and turned loose, symbolically removing all the transgressions of the people away from the camp. Thus, the Day of Atonement symbolized the reconciling of the Israelites to God. Feast of Tabernacles and Last Great Day: This was a festival period beginning with the 15th day of the 7th month, a holy day, and continuing through the 22nd, another holy day. During this time the Israelites were to build temporary shelters or booths (Hebrew) comparable to that used by a watchman in a field or vineyard. This led to the designation "Feast of Tabernacles" or "Feast of Booths" (Hebrew sukkot). This festival corresponded to the end of the autumn harvest. A distinction is made between the first seven days of the festival, the Feast of Tabernacles proper, and the last or eighth day. Some passages refer only to a feast of seven days (Deut. 16:15). Leviticus 13:33-36 shows that the last or eighth day is in fact a separate festival. That is, just as the Passover commences the Feast of Unleavened Bread but is a distinct celebration, and just as the Wave Sheaf Day is a distinct celebration even though falling within the Feast of Unleavened Bread, so is the Last Great Day the consummation of the Feast of Tabernacles though considered a festival in its own right. The regulations for observing the festivals are contained primarily in the legal sections of the Pentateuch. In the historical and later books only passing reference is made to the annual holy days. Certain references in the historical sections strongly imply that whole periods went by in which there was little or no celebration of the holy days. Following are some of the more important passages. Joshua 5:10-11 describes the first Passover after Israel crossed the Jordan. Chapter 6, which tells of the destruction of Jericho, may envision the seven-day siege as the seven days of unleavened bread; but this is nowhere explicitly stated. Nothing is stated in the book of Judges-which describes a period of partial anarchy and feudal chaos-except for 21:19: "Behold, there is the yearly feast of the Lord at Shiloh." The exact feast is not named. The first chapters of I Samuel show a functioning sacrificial center at Shiloh where the ark and the Tabernacle were located. None of the festivals are mentioned by name. However, the general description plus the mention of Elkanah's coming up annually suggests that the annual festivals were being observed in some manner. The ark continued to be a religious symbol, but the actual extent of a fully functioning religious system is not clear. Only after David captured Jerusalem and transferred the ark was there an atmosphere which both allowed and encouraged the traditional observances. David proposed to build a temple but was prevented. Under Solomon, with the construction of the Temple, a full temple service was instituted. This is the first explicit mention of festival observance outside the Pentateuch. I Kings 8:2 states: "And all the men of Israel assembled to King Solomon at the feast in the month Ethanim, which is the seventh month." It was at this Feast of Tabernacles that the ark and the holy vessels were brought up to the Temple (see also II Chron. 5-7). The temple service was continued through Solomon's reign and for a time afterward (e.g. II Chron. 8:12-13). However, with the split of the kingdom under Rehoboam, the northern kingdom of Israel ceased to go to Jerusalem to worship. Instead, Jeroboam set up calves of gold in Dan and Bethel and ordained a festival in the eighth month (I Kings 12:25-33). After this there is a period of approximately two centuries in which worship at the Jerusalem Temple by the northern tribes evidently fell into oblivion. At various points the books of Kings mention that individual kings over the northern kingdom continued to follow "the sin of Jeroboam the son of Nebat" (e.g. I Kings 15:34; 16:26; 22:52; II Kings 3:3; 10:31). The next mention of a major festival observance is under Hezekiah, shortly before the fall of the northern kingdom (II Chron. 29-31). But evidently this revival was short-lived, undoubtedly because of the acts of Manasseh, his son. It was not until the time of Josiah that the Temple was repaired and the services begun again. At that time a copy of the law was found and its instructions followed. This shows the depths to which worship of God had degenerated (II Kings 22-23). A Passover was observed according to the law "...no such Passover had been kept since the days of the judges who judged Israel, or during all the days of the kings of Israel or of the kings of Judah" (II Kings 23:22). It was almost a century before another festival observance is mentioned. With the return of the exiles from Babylon, worship services were set up again, the Feast of Tabernacles was kept in that first year even before the foundations of the new Temple were laid (Ezra 3: 1-6). Yet some three quarters of a century later, at the time of Ezra, we find the temple service evidently requiring some revival. Despite the new Temple, the law was still in need of promulgation. Exactly what had happened in the meantime is not clear; it is clear that the law was being little observed. Even though the Feast of Tabernacles was observed with the first return of the exiles, this seems to have been forgotten until Ezra made it known again to the people in the time of Nehemiah (Neh. 8). After the time of Ezra and Nehemiah, there are long periods for which we have very little information. Yet the Temple survived and the service continued to a greater or lesser extent. With the second century B.C. our information becomes much fuller. Despite the attempts at extirpation by Rome, the temple service continued basically unabated for two centuries before the destruction of the Temple in 70 A.D. It might be noted here that the new moons are often mentioned in association with festival celebrations in the Old Testament. During the lengthy centuries when the calendar was determined by observation of the new crescent, witnesses had to report to the proper authorities and the new month could officially be declared. The day of the new moon was, consequently, very important. Therefore, the new moons were always given a certain special regard. On the other hand, new moons are never designated holy days. They are not included in any of the lists of festivals. No special sanctity is ever attached to them. The only extraordinary regard accorded them was that certain special offerings were carried out on their days. But this did not in any way hallow them, since offerings were offered every secular day as well. They also lost something of their former special function when the calendar became determined solely by calculation in the early centuries A. D.
In scholarship it is widely acknowledged that the early Church continued to observe the annual holy days of the Old Testament: "In the early Christian Church the propriety of celebrating the Festivals together with the whole of the Jewish people was never questioned, so that it needed no special mention" (The New International Dictionary of new Testament Theology, vol. 1, 628). However, it is obvious that the annual festivals took on a new significance in the apostolic Church and were transformed into celebrations. Jesus Himself played a great part in this by His teachings and example. The gospels show a number of examples of Jesus observing various festivals. It was so expected that He would be in Jerusalem for these occasions that people waited to see whether He would come when His life was in danger (John. 7:11; 11:55-57). In addition to His last Passover, He came to Jerusalem on at least one other Passover (John. 2:13), as well as spending one in the region of Galilee (John. 6:1-4). John 7 describes happenings during a particular Feast of Tabernacles. Unnamed feasts are mentioned in John 4:45 and 5:1. He also attended the Feast of Dedication (Hanukkah), even though this was not one of the Old Testament institutions. By far the most important festival of Jesus' life was the one at which He was betrayed. On this occasion, He met with His disciples at the beginning of the 14th of Nisan. It is clear not only from the gospel of John that He had the Last Supper a day earlier than the Jews (John I8:28), but this is also indicated by passing remarks in the Synoptic gospels. (While it is recognized that there are still some unanswered questions in any attempt at harmonizing all four accounts, it is evident that Jesus took His Passover a day earlier than the Jews.). In any case, Jesus at this time changed the symbols of the Passover for Christians and also went through the ceremony of washing the disciples' feet. Then He died as the Passover Lamb of God. The apostolic Church had its own beginning some several weeks later on the day of Pentecost. Again, an Old Testament observance immediately took on deep new Christian Significance for the Church, because the Holy Spirit was first sent on that day. Various of the festivals are mentioned elsewhere, though generally only in passing. Pentecost is mentioned twice besides Acts 2 (Acts 20:16; I Cor. 16:8). The Day of Atonement is called by its common designation of the time, "the Fast" (cf Acts 27:9). These all indicate an environment in which the holy days were known, accepted and observed. "Cleanse out the old leaven that you may be a new lump, as you really are unleavened. For Christ, our paschal lamb, has been sacrificed. Let us, therefore, celebrate the festival, not with the old leaven, the leaven of malice and evil, but with the unleavened bread of sincerity and truth." As most commentators and scholars who have written on verse point out, observance of the Feast of Unleavened Bread is presumed. Otherwise, the play on being physically versus spiritually unleavened, and the reference to "let us celebrate the festival" would have no meaning. Again, this passing reference shows a time when festival observance was taken for granted. Of course, the most detailed discussion is devoted to the celebration of the Christian Passover. I Corinthians 11:17-34 gives detailed directions on how to take the "Lord's Supper" (kuriakon deipnon) or "communion." The memorial celebration was conducted "on the night when He was betrayed," that is, the evening at the beginning of the 14th (v. 23). The symbolic meaning will be discussed further below. The scriptures often cited by Christian churches to refute the necessity of keeping God's holy days-Galatians 4:10 and Colossians 2:16-are discussed under Sabbath. Suffice it to say here that if it is assumed that Paul was "doing away" with the holy days, the relative obscurity of the specific meaning of these scriptures and the general lack of importance of the whole issue is totally incongruous and inconsistent with the enormous importance of these holy days in the religious environment of the times. The fact that Paul stated that the holy days "are (present tense) a shadow of what is to come" (Col. 2:17) in no way lessens the Christian's obligation to keep them. (The present tense reference to the holy days is interesting by itself, indicating continued Church observance.) Indeed, for the Christian, who can now see in these God-ordained feasts the profound spiritual substance of salvation through Jesus Christ, the imperative to keep the holy days is far greater now than ever. The holy days serve as an outline or picture of God's salvation plan-both for the individual and for mankind in general. This understanding is based on a multitude of scriptures and is ultimately derived from the examples of Jesus and the New Testament writers who expound the meaning of some of the celebrations in unequivocal terms. The holy days not only teach us God's plan of salvation, they point us directly to our Savior Jesus Christ. Christ is our Passover. It is by putting on Christ that we put out sin (Unleavened Bread). Christ was the first of the first-fruits, and it was through His resurrection that we can receive the Holy Spirit as Counselor, Comforter, or Advocate (Pentecost). It is Christ who is going to intervene in world affairs on the Day of Trumpets and become King of kings and Lord and lords. Those who have accepted Christ are now at one with Him through baptism and His Spirit-having their sins forgiven. Christ is coming to set up His government in the Millennium and rule this earth, and His people are now preparing the way for and are representatives of that Kingdom by following in Christ's footsteps (Feast of Tabernacles). Finally, Christ shall make salvation available to everyone in the last great step of His plan, which is the ultimate conclusion of His personal sacrifice as our Savior (Last Great Day). The Church keeps God's annual holy days in their true spiritual intent as constant reminders of the plan of God. It stresses their spiritual meaning just as Paul did in I Corinthians 5 when he wrote: "Let us, therefore, celebrate the festival with the unleavened bread of sincerity and truth." Passover: The bread and wine which Jesus instituted at His last supper and which are taken yearly by the Church today are explained symbolically both by Jesus Himself and by the apostle Paul. The wine represents the shed blood of Jesus who gave Himself as an offering to pay for all the sins of mankind. That full and complete sacrifice makes it possible for one to have any and all sins forgiven upon repentance. The wine also represents the New Covenant made between God and the Christian by the blood of Christ. The bread represents the body of Jesus which was torn and beaten for us all, in Christ's ultimate sacrifice for mankind. Perhaps the fullest discussion of its meaning is found in John 6, in which it is shown that Jesus is the "bread of life." The eating of the bread and the drinking of the wine represent partaking of the eternal life which only God can give. The beaten body of Christ also represents the stripes He took on His back enabling us to claim the gift of divine healing for our physical infirmities (Is. 53:4-5; I Pet. 2:24). The purpose of the foot washing ceremony is explained by Jesus Himself as being to show true humility and the proper sense of service (John. 13:12-17). No one can be greater than His Lord, who is Jesus Christ; yet Jesus was the greatest servant of all and gave more than anyone else for mankind. This spirit of Christian love and service is expressed symbolically by washing another person's feet and then allowing that person to reciprocate. Thus, the Passover represents Christ's sacrifice for all- both the individual and the world-and pictures the initial step in salvation. Only through acceptance of this sacrifice can one repent and be forgiven. Repentance is the first stave in individual conversion. 'The Feast of Unleavened Bread: Leaven is used to symbolize a number of things, both good and bad. In relation to this festival it is a negative symbol, representing sin (I Cor. 5:6-8). The putting out of leaven from one's house pictures ridding one's life of sin as a continual process. It also represents the action of the new convert in attempting to leave the world (symbolized by ancient Egypt) and in removing sin from his life. Conversely, the positive act of eating unleavened bread represents our conscious desire to actively seek a sinless way of life in following God's laws. The crossing of the Red Sea is symbolic of baptism (I Cor. 10:1-2). Ancient Israel crossed the Red Sea sometime during the Feast of Unleavened Bread (some commentators suggest on the last day). The new convert soon finds that it is not so easy to leave "Egypt" (the world), that "Pharaoh's army" (sin) comes pursuing him. But God provides help and leads him safely through baptism, driving back the power of temptation, sin and the world through His Holy Spirit. Pentecost: Pentecost is the anniversary of the founding of the New Testament Church. It initiates God's plan of salvation for the world. Just as Pentecost marked the spring or first harvest, so Pentecost symbolizes the first small harvest of individuals through God's Church. In the salvation of the individual, Pentecost represents his receiving of the Holy Spirit after baptism. This Holy Spirit enables him to do what he could not do before, just as the disciples were able to go forward in spreading the gospel in a way totally impossible before the Holy Spirit came. An example is Peter's boldness in proclaiming the gospel so soon after clear cowardice when Jesus was betrayed. (A late Jewish tradition holds that ancient Israel received the law from God at Mount Sinai on Pentecost. This would make sense, since only through God's Holy Spirit can a person keep God's law in its true spiritual intent.). Feast of Trumpets: Trumpets were an instrument often used to sound the alarm for war. They were also the instrument of the watchman to arouse the sleeping populace if danger threatened. This festival represents the preaching of the gospel to the world by God's faithful watchmen who have the responsibility of arousing the people from their spiritual slumber (Ezek. 33:1-16). At this point, God has ceased to let mankind go his own way. The time has come to save not just a few in His Church, but all peoples-to save man from himself. Otherwise, man would succeed in destroying himself. The Day of Trumpets also symbolizes the resurrection of all who died in Christ and the change of all who will be living in Christ. This stunning event-the achievement of eternal life for millions through birth into the Family of God-will occur simultaneously with the return of Jesus Christ at the last trump. "In a moment, in the twinkling of an eye, at the last trump: for the trumpet shall sound, and the dead shall be raised incorruptible, and we shall be changed" (I Cor. 15:52). Jewish tradition adds some interesting parallels. For example, the Day of Trumpets (Rosh Hashanah) is said to picture the most important judgement time, when the inhabitants of the world shall be judged by the Creator. Furthermore, Tishri I was considered by some Jewish commentators to be the beginning. of Creation-which would create a complete parallelism, since this shall be fulfilled by the "Day of the Lord," the time of the Creator's physical return to His creation as Jesus Christ, King of kings and Lord and lords. Day of Atonement: The Day of Atonement symbolizes both the reunion of God and man after Christ returns to earth, and the binding of Satan to render him inactive. The evils of human nature are the attitude of Satan the devil. As long as the source of evil remains active, evil will have a part in subverting the world. At this time, the sins of the world shall, correctly, be placed on their source, as symbolized by the Azazel goat which was sent away into the wilderness. Satan shall be chained and no longer allowed to deceive the world (Rev. 20:1-3). This is not to diminish our own role in sin, for the Day of Atonement also represents the reuniting of God and man through the sacrifice of Jesus Christ for the sins of mankind. * An interesting interpretation of the Feast of Tabernacles as symbolic of the millennial reign of Christ is found in the writings of the late third century Catholic commentator, Methodius. Although he evidently did not keep the festival himself, he perceived it-perhaps reflecting an earlier tradition-as picturing a time when the "earthy tabernacles" would be put off and Christians made immortal would celebrate the true feast (Symposium 9.1). The Last Great Day: Despite a thousand years of peace and happiness, it must be remembered that untold millions have lived and died without ever having had the knowledge to understand salvation. The Last Great Day represents the time when they shall be resurrected and given that chance-not a second chance but a first chance, a chance they will not have had before. Only then shall God's initial plan for mankind be at an end. Thus, this last great holy day of God pictures the greatest period of salvation for mankind-the Great White Throne Judgment (Rev. 20:11-15). The culmination of the plan of salvation is marked by the renewal of the whole creation in the new heaven and the new Earth (Rev. 21). Death and destruction are now no more; human history is now at and end. The Kingdom of God has become eternal. The Church observes these same holy days given by God in the Old Testament, and upheld and kept by the Church of God and the apostles in the New. The major distinguishing feature of the annual holy days is their spiritual function and significance. They provide the opportunity to forget the mundane day-to-day cares of the world and to concentrate on the things of God. In addition to private worship and devotion, church services are held just as on the weekly Sabbath. At these services, the spiritual significance of the particular festival or holy day is generally the theme of the sermons. The need for periodic festival celebrations seems intrinsic to all human beings. It is doubtful whether there has been a human culture in recorded history without certain annual or periodic observances. This need is met in the Church today in the manner our Creator ordained, by continuing to maintain the annual festivals kept in the Old Testament and by the early Church. Like the weekly Sabbath, these days have necessary spiritual, psychological and physical purposes. The functions of the annual holy days are partly the same as those of the weekly Sabbath. They provide physical rest from the regular routine. Yet there are a number of differences on the purely physical plane of observance. The annual festival periods provide high points of the year as social occasions on which to see friends and relatives and during which one can have the means and the leisure to enjoy good food and recreation. Psychologically, the annual festivals usually allow a more lengthy break from regular routine than does the weekly rest day. They are something to look forward to. They provide the occasion for doing things as a family unit. While they differ somewhat from the traditional modern holiday or vacation, their psychological function is very similar, especially for those who do not have other vacation periods during the year. One of the major differences of the annual festivals from the weekly Sabbath is that Church members are enjoined to follow the biblical injunction of Deuteronomy 14:22-26, and set aside up to one tenth (or tithe) of their income in a special fund for use in celebrating these days. (See Tithing and Giving.) This provides the opportunity for the enjoyment of extra-special food and drink. During the non-holy days of a festival, suitable recreation is also encouraged, especially for the family unit. A special offering is taken on the annual Sabbaths in accord with Deuteronomy 16:16-17. In addition to regular church services on each of the annual holy days, the following festivals have their own special observances. The Passover [Lord's Supper] is observed in the evening at the beginning of Nisan 14 in a very solemn ceremony, the most structured of any of the annual assemblies. The order, is first the foot washing service, then the taking of the bread, and finally the drinking of the wine. Before each part of the ceremony appropriate scriptures are read. The service is concluded by a reading of selections from John 13-17. The next night, the evening at the end of the 14th and the beginning of the 15th, is marked by a joyous celebration of small groups in individual homes. This is, of course, the time of the Exodus of Israel from Egypt. The entire seven-day period is a time of eating only unleavened food products. All leaven is removed from the homes before sunset [even] at the end of the 14th. The Day of Atonement is kept by a complete fast (no food or drink) from sunset [even] to sunset [even]. (Exceptions are of course made by the individuals themselves in cases of serious illness and the like.). The Feast of Tabernacles is considered the highlight of the sacred year. It is primarily for this festival that Church members save special funds. Since the Feast of Tabernacles is celebrated only in certain central locations, most members must travel a certain distance to attend, and spend the entire time away from home. While actual booths are no longer built, the same symbolism is maintained by the fact that Church members live in temporary dwellings (motels, hotels, campsites) away from home. Of course, in order to spend the eight days away from home, as well as to meet the expense of travel to and from the place of assembly, saving ahead is necessary (cf. Deut. 14:22-26). Along with the weekly Sabbath, these festivals place worship and service of God at the forefront of the minds of Church members. Rather than taking over former heathen celebrations which have been syncretized with Christian observance or making up celebrations without any precedent, the real human need of regular festive celebrations is met by age-old, God-ordained observances clearly attested in the Bible itself. The days carry a symbolic teaching which looks forward as well as backward and places God squarely in the center-the focus of its range of vision. The Old Testament prophets looked forward to the rule of God's Kingdom on the earth (a time identified as the 1,000 year rule of Christ described in Revelation 20). Some of these prophets describe holy day observance in several passages. One of these passages is Ezekiel 40-48, in which an eschatological temple is pictured in detail. Along with the weekly Sabbath (described under Sabbath), the annual festivals are referred to in a general way in several verses (45:17; 46:9,11). The Passover and Feast of unleavened Bread and the Feast of Tabernacles are named specifically (45:21-25) as being kept in the prophetic Kingdom of God. Zechariah 14:16-19 pictures a time when all nations shall come up to Jerusalem to worship at the Feast of Tabernacles. Those who refuse shall be punished by natural disaster until they repent and worship as God desires. This demonstrates that the annual festivals of God are not restricted to Israel but rather are designed for the entirety of mankind. Leviticus 23 - Description of the Holy Days. Joshua 5:10-11 - Describes the first Passover after Israel crossed the Jordan. John 2:13 - Jesus keeps Passover in Jerusalem. John 6:1-4 - Jesus keeps Passover in region of Galilee. John 7 - Jesus keeps Feast of Tabernacles. Acts 2 - Church begins on Day of Pentecost. Acts 27:9 - Day of Atonement mentioned. Acts 20:16 - 1 Cor. 16:8: Pentecost mentioned. 1 Corinthians 5:6-8 - "Cleanse out the old leaven"
1 Corinthians 11:17-34 - detailed directions on how to take the Lord's supper. Colossians 2:17 - Paul states that Holy Days (present tense) are a shadow of what is to come-Plan of God. John 6 - Jesus is the "bread of life". Isaiah 53:4-5 - 1 Peter 2:24: By His broken body we are healed. John 13:12-17 - Jesus institutes foot washing service. 1 Corinthians 15:52 - The Resurrection. Revelation 20:1-3 - Satan chained for 1,000 years. Revelation 21 - New heavens and new earth. Deuteronomy 14:22-26 - Set aside a tenth of your income to enjoy the Holy Days. Deuteronomy 16:16-17 - Bring offerings before the Lord on the Holy Days. a) to afford the church more opportunity for fellowship. b) test our obedience to God. c) to reveal the Plan of God. 2] The Holy Days fulfill the spiritual objective of being holy convocations for the church today. True or False? 3] Complete this sentence: The Passover represents the sacrifice of __________. 4] The bread we take at Passover represents the _______of Christ. The wine represents His ____. a) putting sin out of our lives. c) the entire Salvation Process. d) practicing a new Godly way of life. a) the foundation of the New Testament church. b) the sending of the Holy Spirit for the individual. b) member eats no leavened products. c) no leavened products are to be found in the home. d) includes two Holy Days. f) a, b and d only. b) the day after the Sabbath. c) the Monday after the Sabbath. a) a Saturday to a Saturday. b) a Sunday to a Sunday. c) a Monday to a Monday. 13] There are no specific examples of the Holy Days being kept in the Old Testament times (Joshua-Malachi). True or False? a) they were used to mark the beginning of a new month. b) were held in a special regard. e) were not especially used to determine new months after early centuries A. D.
15] The primary reason one does not see extensive discourse in the New Testament on the Holy Days is because everyone was keeping them. True or False? 16] Jesus never actually kept any of the Holy Days while He was on earth. True or False? a) betrayed during the Passover [Lord's Supper]. b) scripture records Him keeping at least 3 Passovers. c) keeps the Feast of Tabernacles. 18] On what Holy Day did the New Testament church begin? 19] The imperative to keep the Holy Days is far greater now than ever. True or False? a) partaking the Law of God into our minds. b) partaking Grace into our hearts. c) partaking of eternal life into us. a) for a chosen few. 24] The children of Israel crossed the Red Sea during what Holy Day season? a) Israel crossed the Red Sea on the last Holy Day of the Days of Unleavened Bread. b) The Law was given at Mt. Sinai on the Day of Pentecost. a) the return of Christ. b) the spread of the gospel. d) important judgment time for mankind. f) all of the above. 27] What day symbolizes the putting away of Satan for 1,000 years? a) the life of Jesus Christ on earth. b) the putting away of Satan for 1,000 years. c) the millennial reign of Christ. 30] The Last Great Day represents a time when all who lived but never truly knew Christ will be resurrected. True or False? a) their second chance at Salvation. b) their first and only chance at Salvation. c) a first chance for some and a second chance for others. 32] The Last Great Day also pictures eternity after the time of the Second Resurrection. True or False? 34] On which of the Holy Days are we to keep a complete fast (no food or water) for 24 full hours? 35] The Feast of Tabernacles will be kept in the Millennium. Where do we read this in the Old Testament?